I needed to do an immediate recipe revision. Anyway, the only way my family truly enjoys beef is when it has been slowed cooked, so I decided to grab the main elements of Dorie's recipe and make a slow cooker meal. After I dropped my son off at school, of course he needed to missed the bus TODAY; I flew to the grocery store… flew home, threw everything in the slow cooker and made it to my 11 am dentist appointment. 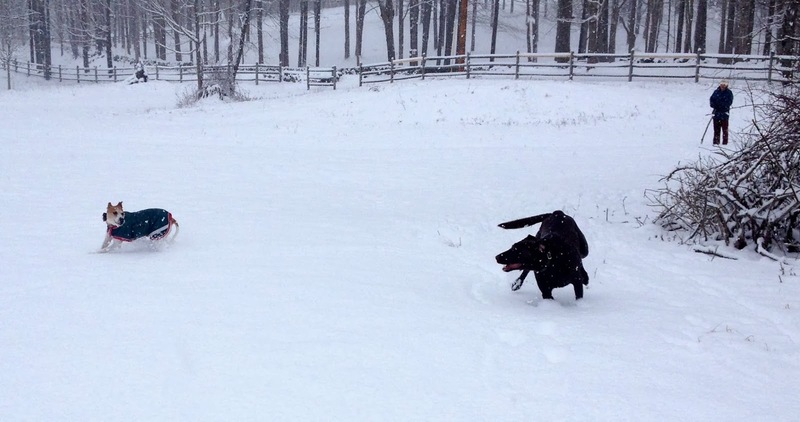 The dog and I enjoyed skiing in the afternoon, and I even managed to drive the kids to fencing. 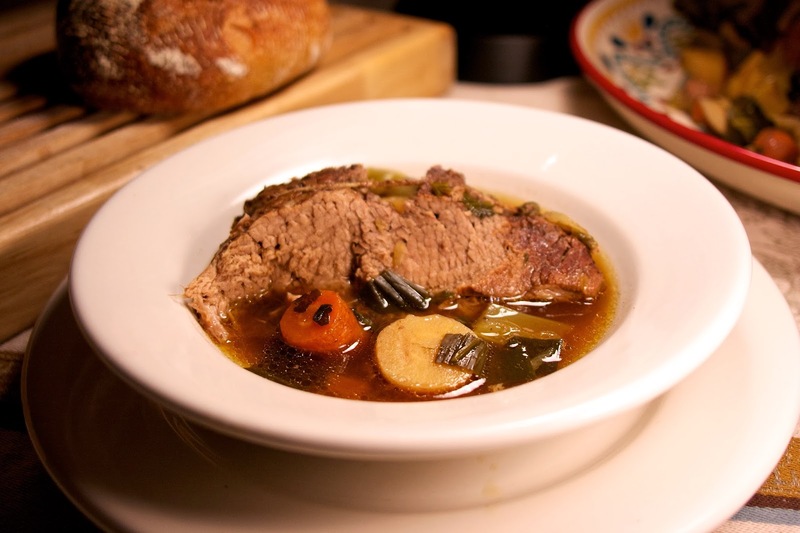 We came home to a delicious pot roast that had a wonderful broth. The leftover meat was chopped up and thrown into the broth.. later in the week it will be reincarnated as beef barley soup. Sometimes you just don't have time to make a bouillon. 1) Tie the beef in 3 places with twine to keep it's shape. Salt and pepper it and put it into a large slow cooker. 2) Chop vegetables and nestle them around the meat. Put the potatoes on top so they don't over cook. 3) Whisk the ingredients for the broth together and pour it over the meat and vegetables. 4) Cook on low for 6 to 8 hours. Serve with crusty bread and butter. The meat can be garnished with mustard or horseradish. Oh my ! you've had quite a day ! I had initially decided on cook a chicken version of this week's assignment but then I saw oxtail in the ingredient list and decided to skip the recipe altogether. Your plate looks comforting. Glad you all enjoyed a good meal. Tansusree I think this work as a pork recipe, not sure about chicken. The broth is ridiculously complex. This sounds delicious Diane! We finally got some snow here this week, but not enough to close schools around here. I hope you're all staying warm, and safe on those roads! I think we got your snow Adelina.. this has been a very snowy winter for us. Yes, we are gathered around our wood burning stove... thinking about what dessert we will make today. My daughter loves to bake on snow days. HI Diane! Delicious recipe! We make something very similar, only on stove-top. Its funny I was in New York all weekend for my grandson's birthday, and made it back home yesterday just before the second storm hit today. Anyway, I want to Thank you for the invite to your Foodie-Friday! We would be honored to be a part of that! But, if you have a link, or easy instructions how to add to it, please let me know ( I am not that good with technology). The link doesn't go up until tomorrow night and there are instructions. All you do is click on "add your link" and past in the URL to the specific post you want share. You write in the title and hit submit. Looks like a great revision of Dorie's recipe! Hope you thaw out soon! Our Sunday snow storm looks like it's going to be smaller than expected. Fingers crossed. These days you really can find great stock.. almost no need to track down an oxtail.. unless you just want the challenge. What a lovely rendition! Days like the one you had are always crazy! Glad this turned out for you! It worked for that day. Thank you for sharing the slow cooker version! I love it. Thank you, it was inspired out of necessity. Yes, the dog makes sure I enjoy walking in any weather. I like your adaptation. Good thinking on your feet. Having a dog truly keeps you active. There are days I would never had gone outside if it wasn't for the dog. I didn't even entertain making the buillion - it made the dish too expensive. I loved it despite using pre-made stock. It did sound a bit pricey for broth... the quality of premade stocks these day is so high you really don't need to make it from scratch. Thanks it was easy and tasted very good. Love your version of this meal…I love using my slow cooker on busy days…it’s so nice to come home to the smell of a wonderful meal ready to serve! Tell me about it... it is the best. My kids are at a busy age but neither drives yet, and we live 20 minutes from anything. In retrospect I am happy I need to make this on a busy day, now I have an easy slow cooker meal that went over well with the whole family. This was the week to stay close to home and eat warm, hearty foods. Hope your tooth is recovering - ouch. I officially feel old needing to get a crown on my tooth. Doing well thanks. Hope it came out well for you. Let me know if there were any problems. Linked it up. Thanks for the invitation. Thanks Liz, I'm doing OK, and I did get a good quick meal out it. Long cold winter... and I love the snow, but we have had too many snow days and it is making it hard to get anything done. First off, so sorry to hear about the tooth. We have been having storm after storm in the Philly area and it is wreaking havoc with schedules and dr appts, so I can't imagine adding an emergency dentist visit in. But you nailed it all, including that skiing. Great job. And came home to a wonderful meal. Love the idea of the beef barley soup- excellent. Tooth is doing OK, thanks... in retrospect it was a very productive day. Fabulous looking recipe and I love your 'about me' on this page. You are amazing! Stopping by as co-host of Homemade link Party. Thanks so much, we lead a nice life out here in the woods and yet, so close to NYC. I'm making beef barley soup today with the leftovers. Time for me to drag out my slow cooker from storage!! Love your 'about-me' page too! Yes, drag it out you won't regret starting to use it again. 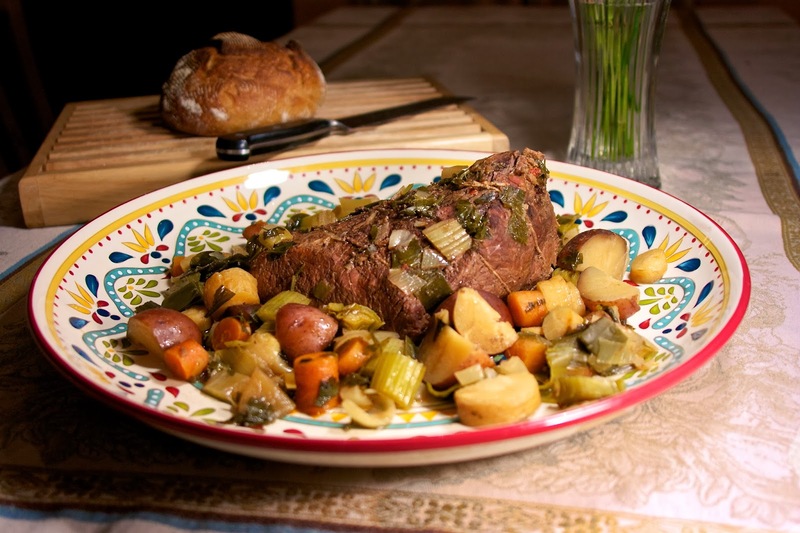 We will really enjoy your Slow Cooker Pot Roast and Root Vegetables, this is one of my favorite's in the cold winter. Thank you so much for sharing with Full Plate Thursday. Hope you have a great week and come back soon! Your approval of a recipe means a lot to me Miz Helen. Next time I'm improvising! I think I spent almost 5 hours in the kitchen trying to make a perfect bouillon - and I really didn't have the five hours to spare. Hope all is better and your tooth is not bothering you. Love the photos of your dogs, and the cover photo for this is really stunning. I have plate envy again. I didn't realize how long the bouillon took. Your'e a sport doing it but unless you are a real purist that's a lot of time for "broth." Yours did look spectacular. At least you can say you made a bouillon. It is a culinary feather in your cap. Dropping by to say that I am featuring your pot roast at Tasty Tuesday this week. Thank you so much for sharing the recipe at Tasty Tuesday. I am featuring it this week. Hope you'll drop by this week and share some more fabulous recipes with us. Hope you have a great week. See you at the party. Thank you so much Tanusree. I just made beef barley soup from the frozen leftovers last night. Have to get a permeant crown on it soon. Never had tooth problems, ah getting older. Yes, the meal was terrific to come home too.. thanks. I hope you get a chance to try it.